RTD District 1 Open House — Longmont! Judy Lubow, RTD District 1 Director, and Joan Peck will be speaking. Comments Off on RTD District 1 Open House — Longmont! Hello Fans of Commuter rail on the NW corridor through FasTracks!! The City Council of Longmont and RTD are having a joint meeting this coming Thursday, April 28th at the Longmont Senior Center, Rms D & E, 910 Longs Peak Ave. The meeting will be between 5:30 pm – 7:30 pm. We’ve been busy since the last update. Karen Benker, as co-founder of C4FF and Joan Peck, Longmont City Council, have addressed the Longmont Chamber, Louisville City Council and the Tri-City Chamber Alliance (Longmont, Boulder and Broomfield) about the need to push for our commuter rail above any BRT buildouts. Karen recently gave an interview on Colorado Matters, representing C4FF (http://www.cpr.org/sitesearch/Karen%20Benker%20and%20colorado%20matters). Joan Peck attended an MCC (US 36 Mayors and Commissioners Coalition) in Washington D.C. This trip was a transportation lobbying trip to talk to the Colorado Delegation about transit in Colorado. Unfortunately, Joan was the only one of the 21 people who attended speaking out and lobbying for the NW Rail Corridor to be completed. The rest of the delegation lobbied for buses in and around Boulder and the bike path parallel to U.S. 36. The good news is that Congressman Jared Polis is totally on board with finishing the FasTracks vision, not any more buses. As a Council woman representing Longmont, Joan has contacted, with success, the Mayors of Louisville, Robert Muckle, Broomfield, Randy Ahrens, Westminster, Herb Atchinson and of course, Longmont, Dennis Coombs to sign resolutions and form a coalition to represent a NW corridor alliance. This alliance, when formed, will work with RTD to create a plan to be presented to BNSF railroad to start a conversation about costs and grants. HOW CAN YOU HELP? Contact your Mayors, encouraging them to form this alliance. We need it done before our Director, Judy Lubow’s term is up in December. Come to the joint meeting in Longmont this Thursday to hear RTD’s response to our comments. Keep the conversation going, we are making tracks!! BE SURE YOU’VE SIGNED OUR PETITION. Comments Off on Public Forum! EVEN THOUGH METRO-AREA VOTERS VOTED TO HAVE THE CORRIDOR BUILT AND OPERATING BY 2017, and have been paying taxes to RTD for 10 years, Boulder County residents will not have any rail corridors constructed until sometime after 2040. However, all other metro RTD rail corridors — that were adopted through the Fastracks vote — have either been built or are currently in the process of being constructed. CITIZENS FOR FINISHING FASTRACKS is advocating for the build out of the full Northwest rail corridor — or any effort to allow the BNSF (Burlington Northern Sante Fe) tracks to be used for commuter rail service. In 2004, the Regional Transportation District (RTD) placed a tax initiative on the ballot for the eight counties contained in the district to build 122 miles of rail across metro Denver. RTD called this the Fastracks plan. This measure passed with a 58% to 42% vote that raised the RTD sales tax rate from 0.6% to 1% beginning January 1, 2005. The rail line to Boulder County is called the Northwest Rail line. This line would begin at Denver Union Station and travel through Westminster, Broomfield, Louisville, Boulder, and ending in Longmont. The line would share the existing Burlington Northern and Santa Fe (BNSF) track. The RTD board decided in 2014 that the NW Rail corridor would be indefinitely postponed. 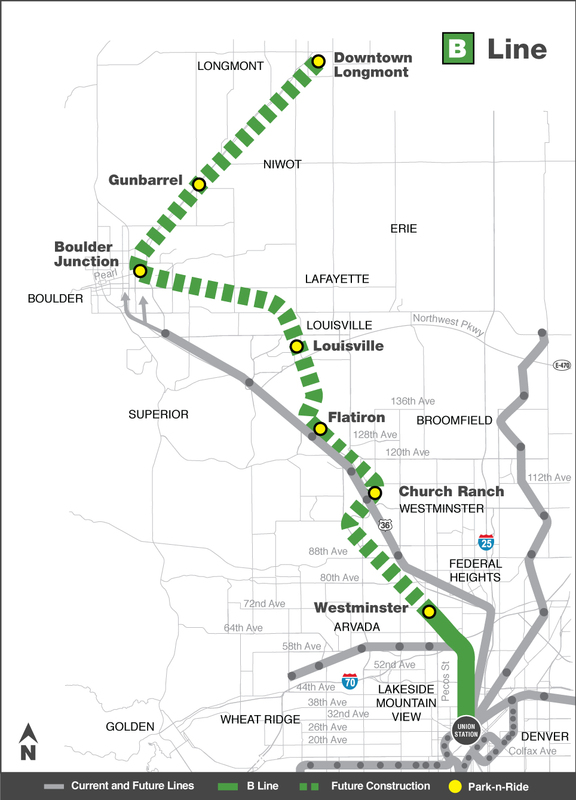 This will eliminate 35 miles of the RTD Fastracks rail plan. It is important to note that 6.5 miles of this corridor will be built and terminates at 71st and Lowell in Westminster but it will be three miles short of reaching the new urbanism development that is replacing Westminster Mall that was torn down in 2011. RTD argues that the reason why NW rail is delayed indefinitely is because of rising costs. In the 2014 Northwest Area Mobility Study (NAMS), the cost is estimated to be $1,140 million (This is broken down by $535 million to BNSF for track improvements, $605 million in RTD capital costs including a new rail maintenance facility, and $140 million in non-RTD costs for added station construction). For comparison purposes, the West Rail Line cost $709 million for 12.1 miles. Originally in the 2004 plan, the cost was estimated to be $508 million. HOW MUCH HAS BOULDER COUNTY PAID TO FUND OTHER RAILWAY PROJECTS? Taxpayers in Boulder County have paid over $17 million just in 2014 to RTD for the Fastracks rail build-out. These tax dollars have helped fund the other 5 metro rail corridors and cost over $7.9 billion. MEANWHILE, Boulder County receives NO rail funding from this tax. Please join CITIZENS FOR FINISHING FASTRACKS and demand rail in Boulder County NOW! READ ABOUT OUR MISSION. TAKE ACTION: SIGN OUR PETITION.